The Sync module lets you configure synchronization settings. Figure 256. Sync module sizes. Right-click the Control Bar and select Modules > Sync. Figure 257. The Sync module. 23.976 frames per second (FPS). Typically used with H.264/MPEG-4 AVC video. 24 frames per second (FPS). Used for theatrical film worldwide. Any film in North America or Japan uses this setting. 25 FPS. Used for PAL/SECAM video and some film in countries that use 50 Hz wall electricity. This is the setting to use when synchronizing to any European video format. 29.97 FPS Drop. NTSC broadcast and long format video in North America and Japan. 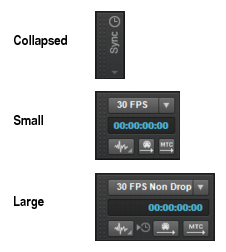 This setting synchronizes the video perfectly with SONAR, but the sequencer position displayed in the Now Time and Big Time displays will gradually drift and become incorrect over long periods of time. The audio and MIDI synchronization to the external device will not be affected by this discrepancy. 29.97 FPS Non Drop. NTSC non-broadcast and short length video in North America and Japan. Used for some music projects. This setting synchronizes the video perfectly with SONAR, but the sequencer position displayed in the Now Time and Big Time displays will gradually drift and become incorrect over long periods of time. The audio and MIDI synchronization to the external device will not be affected by this discrepancy. 30 FPS Drop. Not a standard type of timecode, used rarely for speed correction and transfer problems in tape based systems. 30 FPS Non Drop. Most music projects and some film in North America. This is the best choice for any music project and should be used unless the situation dictates otherwise. Incoming timecode. Shows the current time of incoming time code when synchronizing to an external device. Internal Sync . Timing is determined by the clock on the computer motherboard. MIDI Sync . Timing is determined by the clock on an external MIDI device. SMPTE/MTC Sync . Timing is determined by a time code signal (in SMPTE or some other format) recorded on some external medium or generated and sent by SONAR. Audio Sync . Timing is determined by the clock on the computer’s audio interface. Transmit MIDI Sync . Transmit MIDI Sync to external MIDI devices, such as drum machines, stand-alone MIDI hardware sequencers, and sequencers built into MIDI keyboards (only available when using the Internal or Audio clock). SONAR sends messages to all other devices to start and stop playback and to keep all the devices in sync. SONAR can send MIDI Sync on multiple MIDI output ports. For details, see MIDI synchronization. Transmit MTC Sync . Transmit MIDI Time Code (MTC) to external devices that can receive MTC. SMPTE/MTC is a position and timing reference that indicates the current location in the project and how quickly the project should be playing. SMPTE/MTC time code labels the position in a project in hours, minutes, seconds, and frames. The speed of playback is indicated by a frame rate. SONAR can send MTC on multiple output ports simultaneously. For details, see SMPTE/MIDI time code synchronization.